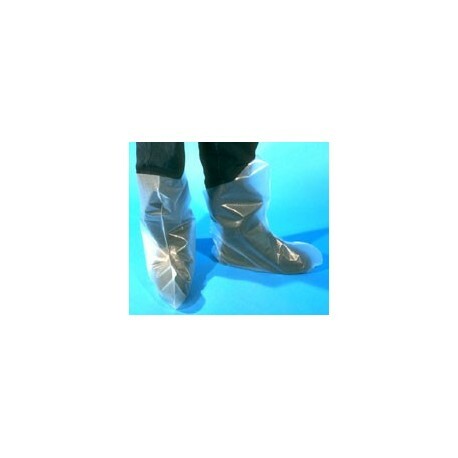 Prevent Tracking of Materials Caused By Unforeseen Contact With Industrial Chemicals With This Disposable Boot. You never know when you will need quick, one time protection from UV materials. Perhaps it is to handle a sudden spill, to show a new client around your plant, because your regular protection is already in use, or some other unforeseen circumstance. To be ready for times like those, SAF-T-CURE (TM) offers a full line of economical disposable safety products. Make sure you are prepared - always keep a set nearby. When spills occur, containment should always be one of the first concerns. But due to the nature of UV materials, there is an added risk of contamination. Leather shoes are porous enough to soak up UV materials and track them throughout the plant or office, often undetected. SAF-T-CURETM DISPOSABLE BOOTS prevent shoe sole tracking and contamination. SAF-T-CURETM DISPOSABLE BOOTS are made of heavy-duty 3 mil thickness clear polyethylene that protects footwear from UV ink and solvent spills and staining. They feature attached ties to keep the boot in place without worries. 50 boots per box. 10 boxes/case.